Afrobeat is specific. 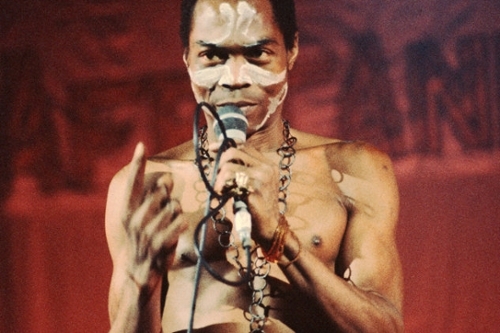 Although many post-'60s Sub-Saharan African musicians have drawn inspiration from the wellspring of American funk, Afrobeat proper can be traced to a single individual: Nigerian bandleader and performer Fela Kuti. Scholars can argue over the specifics, suggesting the ways Afrobeat emerged from developments taking place within Ghanian highlife or the immense debt the genre owes to traditional Yoruban call-and-response patterns. But just as you'd be hard put to negate Bill Monroe's claims of ownership over bluegrass, Afrobeat begins with Fela. A tight mixture of James Brown funk, traditional percussion, horn charts, lengthy jazz-based improvisation and fierce politics informed by Black Power activism, Afrobeat arose from Fela's experiments after visits to both Ghana (where he came up with the name Afrobeat) and the United States (where the band soaked up local Los Angeles rhythms before being tossed back to Nigeria by the INS). For most of the 1970s, Fela was unstoppable, churning out multiple albums per year, many consisting of single lengthy cuts sprawling over both sides of vinyl, bristling with condemnations of colonial mindset and Nigerian authorities. Few could match Fela's outsized personality or notoriety. But Afrobeat has exponentially expanded its reach in the years since Fela's death at age 58 in 1997. Sons Femi and Seun Kuti have continued in their father's footsteps, while such Fela revivalists as NY-based Antibalas have perfected the Afrobeat sound to such a degree they were tapped as stand-ins for the Afrika 70 during the recent Broadway run of hit musical Fela! And the ongoing Afrobeat Revival community is truly global in scope, ranging from Nigeria to Chicago and Germany. Our new Afrobeat Airwaves station is devoted to Fela's one of a kind groove, from the master's own deep catalog to new offerings from his many followers, with plenty of '60s/'70s African funk thrown in for good measure. Whether you're a die-hard Fela fanatic or just beginning to explore this resilient African genre, Afrobeat Airwaves is the place to be.